A truly spectacular black meenakari enamel pendant that can be matched with most of your coloured outfits. Wear it for a wedding or party and you're to make heads turn. The intricacy of work in this pendant is beautifully captured. 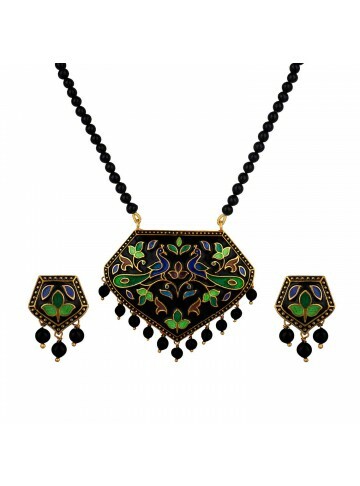 A lovely black enamel pendant set with green, red and blue floral designs etched on the surface. The uniqueness of the product lies in its shape giving it a very elegant look. 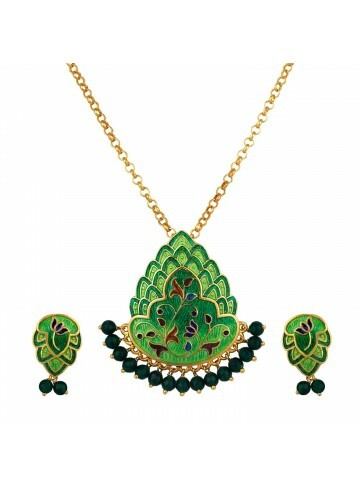 A lovely sea and dark green meenakari pendant set with similar earrings for a nice elegant look. 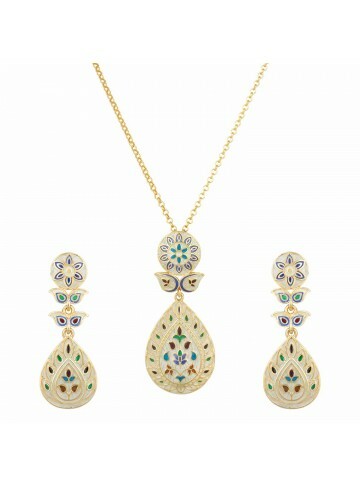 Don't miss the beautiful flowers on the pendant and earring. 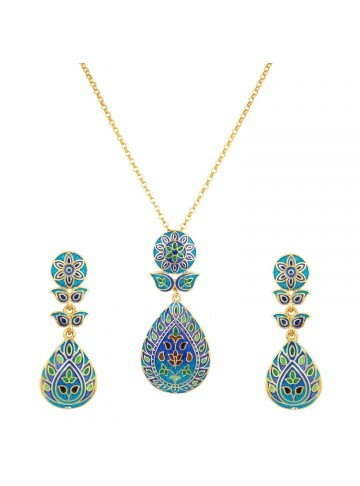 A cute petal shape pendant set in silver and gold plated with lovely meenakari work. Don't miss the pearl! The cute earrings are perfect if you like things simple. 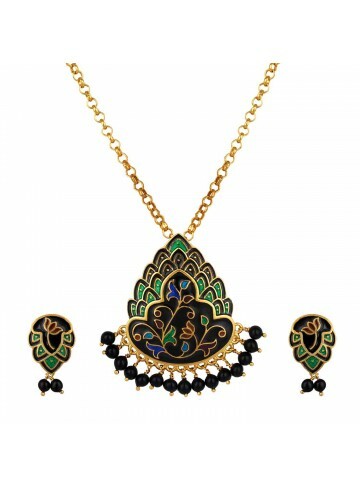 If you're looking for something neutral yet beautifully crafted, this black meenakari pendant set is for you. Wear it this festive season and make a statement! 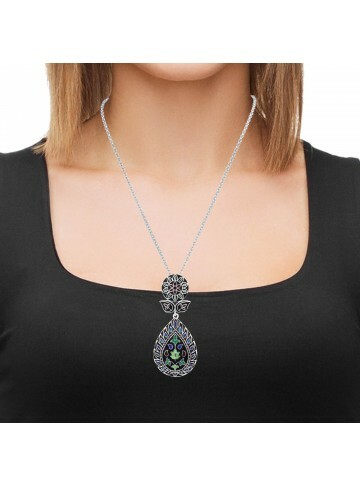 A lovely black meenakari pendant set in a floral shape with similar earrings. Perfect to wear with your western or Indian outfit. The beauty lies in the flawless meenakari work. A handcrafted silver pendant set with etched leaves and a green flower in meenakari work. Gold plated to give it an ethnic appeal. Wear it this festive season and you're sure to stand out with its sheer elegance. 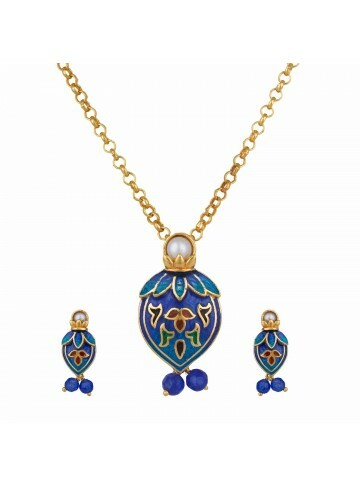 A nice sky blue to deep blue pendant set with a floral design in meenakari, handmade in silver and gold plated. Don't miss out the beauty in the earrings! 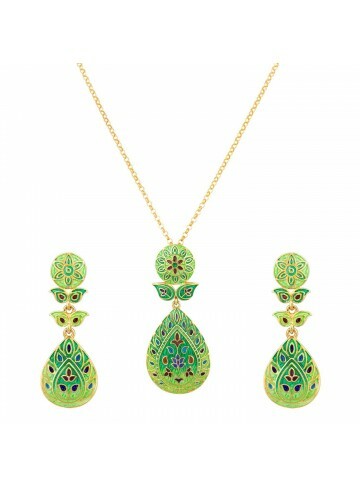 A lovely green meenakari pendant set, handcrafted in silver giving a nice ethnic look. Wear it this festive season and contrast it with any of your outfits.